This (what I hope will be a) series of posts stems from a gig that changed the way I approached all the songs I played that evening (specifically, this gig). Changed in the kind of way that I wish the band had had proper notice of the situation we (well, I) were walking into in terms of the room, the acoustics, and the management. On the plus side, Syracuse is undergoing what I think is a slow expansion of mom+pop places that open their doors to live music. This is just fine for most styles of music and small groups. On the down side, these tend to be small places. This is just fine for most styles of music and small groups. This can be a problem for a set drummer, which can then be a problem for the rest of the band. You rehearse and rehearse with a group at one volume, playing at a level at which you are comfortable playing all the complicated fills and patterns you like. Everyone gets used to hearing certain things and you get use to executing those things. Then you find yourself at a venue with your full kit and an owner who doesn’t seem to like loud noises. And by loud noises, I mean sounds generated by the lightest sticks you own using little more than your fingers to propel them several inches. And I understand the hesitancy an owner might have when confronted by a drummer they’ve never heard, as I’ve certainly sat near my share of drummers who didn’t adjust their playing volume to the room. But with this new adjustment, you’re not playing the same song you (and the band) have grown accustomed to. Now, the whole band may find itself reacting to this new dynamic from the drummer, while all the others in the band had to do was turn their volume knobs down a bit. What’s a drummer to do? You can drag a percussion rig around and hope for a rehearsal or two to get used to it, or see this as a golden opportunity to handle the situation with finesse and no small amount of restrained motion (and brushes and various brush-stick intermediates). Grooving a forte tune at pianissimo ain’t all that easy if you’ve not tried it, but your surprise, volume-reduced, 2-or-3-hour gig gives you plenty of time to find out what you can and cannot do with the music you’re most comfortable with. 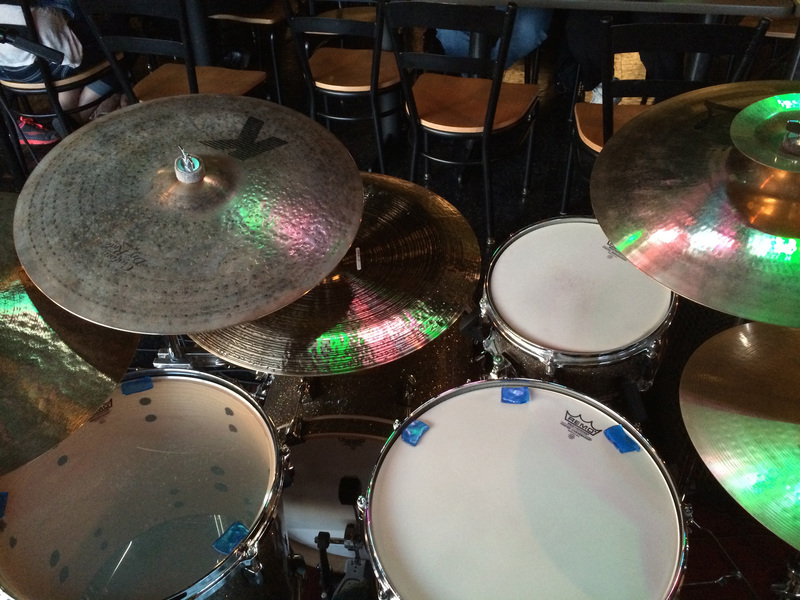 My band Funktion Key 3 had a gig at The Buzz Cafe on 17 May 2014 from 7 to 9 p.m. A 6 p.m. arrival had me rolling gear directly into the band area next to the front door (no steps!) and moving the drum riser out of the way (the riser not being deep enough for a small set and a drum throne by about 12 inches). A stripped-out Pearl S830 Snare Stand (it’s time had come) and plastic bushing removal later, the quick drum tapping to get positions tightened up was enough for the owner to begin playing the levels game – specifically, that my tapping for placement was too loud. If a free-form linear pattern wasn’t going to fly, you can imagine what playing hi-hat and snare together would mean to him. The muted, muffled kit for the evening. Click for a larger view. To a medium-sized bright room and hardwood floor was added a boomy mix at the very front of the room where the band was, which didn’t provide enough feedback to know how loud the band was or wasn’t (from the drum throne, anyway). The first set turned into a brush-and-Hot Rod-heavy one where I was asking for volume feedback every few songs (don’t remember complaints). By the second set, we’d all adjusted to the new, more open, less busy drum sound and I was back to a light pair of trusty Vater Super Jazz’s throughout. As you might expect, dropping the level by two-thirds of what you’re used to (and this from rehearsals in a smallish space) has a significant affect on what you play. Crash cymbals get taps that don’t bring out the cymbal’s bottom end, you ride the ride cymbal mid-way to reduce the ringing, your ghost strokes have almost nowhere else to go when your 2 + 4 are at near-ghost stroke levels, and you’re heal-down on the bass drum pedal and hi-hat. The result (for me, anyway) was playing everything music simpler than normal, which by itself is a very good lesson in adjusting to new feels for the same songs. Now, to reiterate, there are some real lead pipes out there who perform for themselves and not the room. The owner was very, very cool about everything else and I’m appreciative that we had “the discussion” before the gig started, as nothing puts me off more than someone on stage asking for volume (and tempo, don’t get me started) changes mid-tune. You can either play to make your statement, or you can play with the hopes of getting invited back. And we definitely enjoyed the whole experience enough to endeavor the latter. Our taste for the evening was free eats, a healthy tip jar (I’ve made less playing “legit” gigs than the band made this night), a very easy load/unload, and a knowledge that the band can back-off to fit the space. With that, three vids from the first and second sets are below from youtube (the Canon T3i at HD only gives you 12 minutes of video, so “Barrelhouse” gets chopped slightly at the end). Song From The Soul – a Sean Kelly original.